I’m ashamed to admit that when I was younger I found Australian native plants desperate and scraggly-looking compared to their European counterparts. I preferred roses to gum blossoms, tulips to waratahs. As I’ve grown up the beauty of the Australian landscape has grown on me. Every year I look forward to seeing the wattle bloom in spring, will pull over to cut a branch from a flowering eucalyptus. There’s nothing quite like the colour of the Australian sky. Recently I’ve been on the hunt for more clothes and accessories with Australian native motifs, and my search brought me to Doops Designs, a gorgeous range of hand screen-printed textiles, clothes, and homewares designed by a local artist named Jane Newham. I kind of want one of everything (Confetti! Banksias! Chubby bathing ladies!) 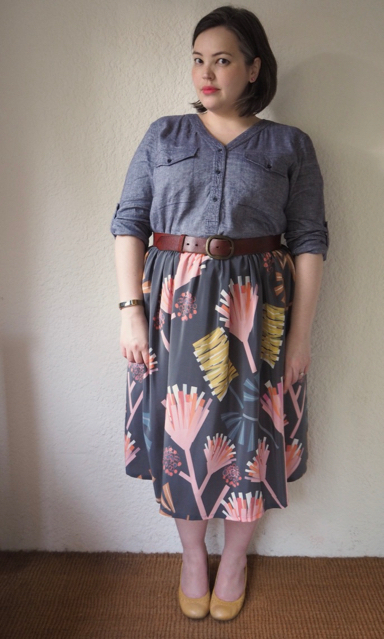 but decided to start with the Protea skirt. It’s not an Australian native (thought it looks like it’s been teamed with banksias?) but it’s pretty close. 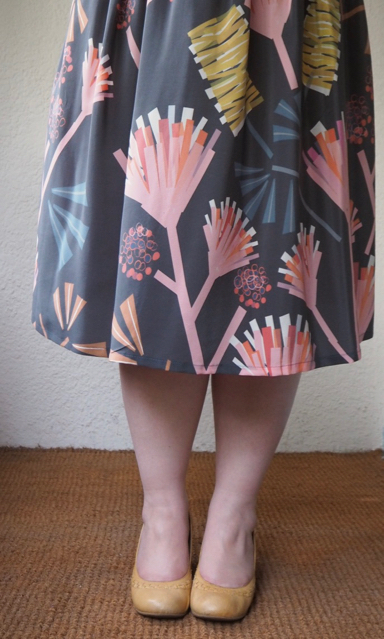 The skirt is available in both a cotton and a silk fabric, but after some deliberation I went with the silk – it’s a bit more expensive, but I thought the soft drape would better flatter my figure. The skirt is a very basic, boxy cut and has an elasticized waistband. It’s very simple and low fuss, but beautifully made and finished. 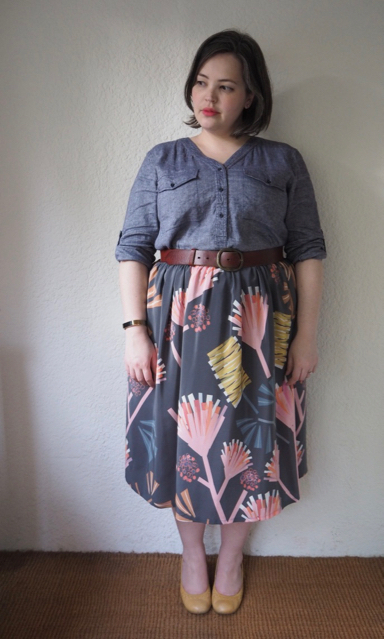 I was surprised with the base colour of the skirt when I received it – I had expected it to be a much darker grey, but the muted shade is probably actually more versatile. It dresses up and down, depending on whether you wear it with a casual tee, or a more tailored short or blouse. Doops Designs are printed with eco-friendly solvent free inks, use ethically sourced fabrics, and produced in a way to reduce their carbon footprint. Which is all lovely. 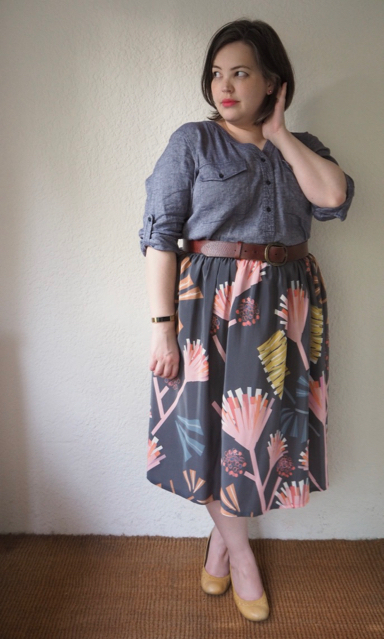 And also lovely is the size range: Jane’s clothing is available up to an XXXL – an Australian size 20, or a 42″ waist (which can comfortably stretch larger). An independent Australian textile designer, with ethical production values and an inclusive size range? More of this, please! 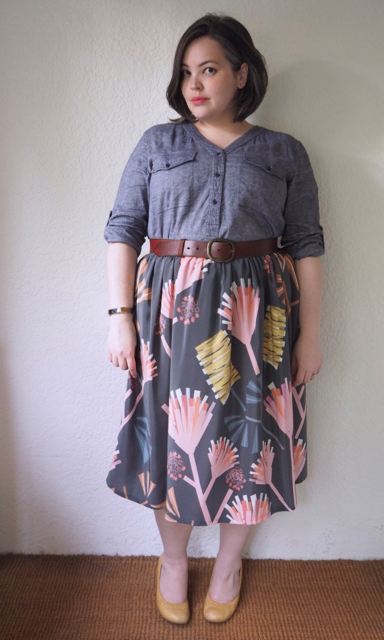 This entry was posted in Uncategorized and tagged doop designs, skirt, top, trenery, warm by lillipilli. Bookmark the permalink. Yaayyy, you look so lovely, and I’ve just bought two dresses! Thanks for alerting me to Doop Designs! 1) The cotton is quite stiff and thick, not a material I would have chosen if I had touched it prior to ordering. I received the cotton dress version of your skirt and the base colour is a blue/purple. I am curious to see how it will behave after washing (if it shrinks it will be unwearable). 2) I also ordered a silk dress in the same size and cut as the cotton dress, and it is a full size larger on the body, much more comfortable! The print is less attractive than the cotton dress but I will probably end up wearing it more often. This is so helpful, thanks Bea! It’s weird about the colour difference between the silk and cotton fabrics. I’ve actually bought the Cut Play skirt in cotton since I wrote this post, and like you, found the fabric quite stiff and crunchy. I’d be interested to see how the jersey looks in person, but I doubt I’d buy another cotton piece from Doops Designs. Hooray! Another great label to buy! Thanks for sharing yet again, Lilli!